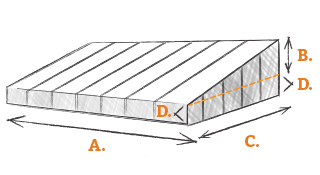 Measure from side to side at the top of the awning. A hem allowance of 1/2 inch (12.7 mm) is added to each side of this width. Awning height measured on structure. The projection will be calculated from both the Height and Depth measurements. A four inch sleeve for the head rod is assumed and automatically added to the calculated projection. Measured at right angles to the structure to the front lip of the awning. The depth of the front valance. A 1/2 inch (25mm) hem allowance is added. If grommet strips are required add 5 inches (127mm) extra to the valance measurement.